With all the talk about public and private sessions and the like, it can be quite hard to make sense of just how you can get to speak to the Commission. It’s still not entirely clear, despite the Commission’s best intentions. Nationally, there will be institutions which will be examined by the Commission; they will be notified of public hearings and there will be public notices posted in the media. But as far as survivors of abuse are concerned, there appear to be a number of ways that people can be heard by the Commission. The first and most basic step is to telephone the Royal Commission on 1800 099 340 between 8 am and 8 pm. There is no time limit to do this. Your details will be taken and someone from the Commission will get back to you. You are asked to be patient. You will eventually have your turn. People can also send a letter or statement to the Royal Commission at GPO BOX 5283 SYDNEY NSW 2001. 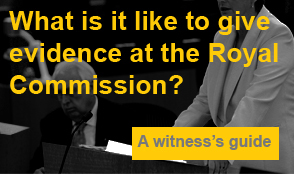 The Commission is offering help for people who would like assistance to prepare a witness statement. It seems that the Commission will get back to you once you have sent your statement. They will get back to you with details of when you will have your session with the Commission. Sending in a letter or statement seems to be an excellent way to get things started. A properly prepared statement with plenty of details, numbered paragraphs in chronological order is easy to follow and saves a lot of time. It seems that this is best way to get your matter really moving along. You can telephone the Commission and ask to speak with a Commission officer who will record your experience and transcribe it into writing. You can keep your experience to yourself and wait for the opportunity to tell a Commissioner in the private session. It seems that people wishing to do this should ring the hotline first, give basic details and then wait to be contacted with the details of the private session or an appointment with a Commission officer. This might be the most cumbersome way to go about it, potentially with longer delays. Public hearing sessions will be granted to various support or advocacy groups. People can choose to tell their experience in a public hearing to a Commissioner as part of their group. Doing it this way seems to have a lot of merit. Having your written statement sent to the Commission as part of a group of statements and going to the hearing with your group is time saving for the Commission. It seems to be an excellent way for the Commission to get through a large volume of work in a short timeframe. Going ahead as part of a recognised group can often lend credibility and weight as well. Public hearings will be streamed live on the web. You can ask for a private session. The legislation allows for this. It is a meeting between the survivor and one or two Commissioners. A support person can be present. People from the relevant institution, church, charity or government department will not be present. There will be no need to worry about facing abusers. Everything you tell the Commissioner in the private session will also assist investigations forwarded to the Police, but your information will not be part of the formal evidence before the Royal Commission. You will not be asked to take an oath or affirmation. However, as Gail Furness SC puts it, it will be expected that you will tell the truth. All private sessions will be recorded. You can even ask for a copy of the transcript. Individuals and institutions who have a “direct and substantial interest” in any matter which is within the Terms of Reference can apply for “leave to appear” before the Royal Commission. Leave to appear is a legal expression meaning permission to be heard at the hearing. You don’t need leave to appear if you only want to tell your experience or make a written submission. Details of the list of public hearings will be published on the Commission’s official website and will say what those hearings will be about. If you have been granted leave to appear at a public hearing you will receive a separate notice. Some people will give information in a private session which will need to be taken further. Some information will need further investigation and will be the subject of a finding by the Commission. It appears that these persons will be asked to also appear at a public hearing and swear an oath or affirmation to tell the truth. Persons or institutions affected by the allegations will be given the opportunity to appear and ask questions. The public hearing will be necessary because the legislation only permits limited use of information given in a private session. It seems that this will be highly likely where the Commission is considering referring the allegations to the Police. But nobody will be forced to give evidence at a public hearing if they don’t want to.